Biofilms And Candida Connection - YeastInfection.Org by Eric Bakker N.D.
Fungal infections in their many forms can seriously impede the quality of life for many people. This is particularly true when the infection, once treated and apparently banished, only recurs time and time again becoming more problematic with each eruption. The cause of the resistance to treatment and recurring infection is only recently being investigated scientifically and they have discovered that the resilience of such infections is due to the concentration of pathogenic cells forming what are known as ‘biofilms‘. Biofilms really are the new kids on the block. The discovery of them has been hindered for a long time simply by the way laboratories have approached their testing of traditional treatments for many fungal infections such as Candida. Even though an individual cell may be responsive to treatment under laboratory conditions, it is now understood that when the cells or bacteria group together they can then form what is ultimately a defensive shield. This shield is called a biofilm. A biofilm comprises a polysaccharide matrix which protects the pathogenic organisms underneath against your immune system. This makes it exceptionally difficult for standard preparations to even reach the infection underneath. Even more problematic is that the structural wall of this defensive shield is particularly tough being comprised primarily of cellulose – the same fibrous material plant stems are formed from. This wall and its composition make it highly resistant to modern synthetic treatments because it is particularly difficult to break down. Even more disturbing is the recent discovery that although standard antifungal treatments appear to initially work they can actually trigger a defensive mechanism in the biofilm and cause it to expand. Research has shown that in a period as short as 72 hours an antifungal treatment was proven to actually increase the resistance of the biofilm to the drug. In short, treating a Candida infection with a standard preparation can actually make the condition worse. Candida strains are particularly susceptible to forming a biofilm. This high rate of incidence provides many people with the answer as to why their infection proves so very difficult to treat effectively. The first barrier to break through in treating a Candida infection is the cell wall so the pathogenic bacteria beneath lose their defensive shield, and, although modern treatments are proving to be spectacularly unsuccessful at penetrating this defense and even in many cases making it stronger and more defensive, there are many, more natural ways of approaching the problem. These enzymes weaken the cell wall and allow good bacteria to enter the defenses and attack the source Candida infection. Yet there are many other ways and tactics available to those who suffer from Candida infections. Even science now strongly suggests that a single anti-fungal strategy is unlikely to permanently resolve any issues related to biofilms and Candida. A multifaceted approach based on supporting the immune system, depriving the pathogenic bacteria of its food sources, together with increasing natural antifungal agents is more likely to be effective particularly in the long term. Candida Crusher provides in-depth information, intelligent discussion and practical advice on how to implement all these factors. The first tactic in beginning the battle against the biofilm is easy – increase the amount of good bacteria in your body. The higher the level of good bacteria the more the bad or pathogenic bacteria are suppressed. Take a good quality natural probiotic such as kefir to increase the bifidobacterium in your intestinal system. The higher the levels of good bacteria, the less chance bad bacteria have to become dominant and the less likely Candida will reoccur. The second tactic could prove a little more difficult for some people particularly those with a sweet-tooth. Since the biofilm is comprised of 32% glucose it is prudent to make efforts to cut off its food supply. To do this it is necessary to decrease your sugar intake. The less sugar you ingest the fewer building blocks the biofilm have to build their defenses. Cut back on the chocolate and desserts in the sure and simple knowledge you are starving your enemy! For some it would seem to be a contradiction: we know that many laboratory tested and manufactured antifungals don’t work or actually make the problem worse, so why don’t naturally occurring antifungals produce the same failure rate? The answer is simple – although we know natural antifungals are beneficial, science doesn’t know why or how. However it has been proven that they are successful in both breaking down the polysaccaride matrix and killing the pathogenic cells beyond. All of which are included in the Canxida Remove ingredient list. Caprylic acid an extract from coconut, is renown for being a particularly effective and totally natural antifungal agent. Some sufferers choose to take coconut oil in isolation which although will have some measure of benefit it is likely to be of limited value. This is because other compounds are required to attack the cellulose layer of the biofilm before the caprylic acid can affect the source infection. Undecylenic acid is a fatty acid extracted from the castor bean. This acid regulates the pH in the small intestine to ensure maximum absorption of nutrients and optimal efficiency of the digestive tract. To balance the pH further Canxida Remove also contains betain HCL (hydrochloride) regulating any excess bicarbonate being released by the pancreas. With the pH regulated in both the stomach and intestine the sufferer has the best chance of absorbing all natural nutrients and providing the essential elements to maintain gut homeostasis. Black Walnut Hull extract is another ingredient patients are unlikely to access easily yet this compound is known for being particularly effective in killing pathogenic yeasts and bad bacteria and is an essential weapon against biofilms. 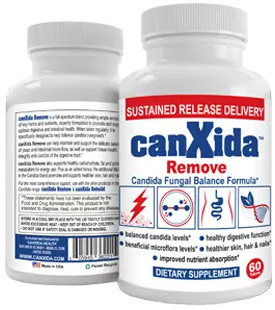 Since many of the ingredients necessary to break down the biofilm and attack the infection are not easily available we can see that taking a Candida supplement such as Canxida Remove simplifies life. Then, by making some lifestyle and dietary changes which are compatible with advice similar to that provided by Eric Bakker in Candida Crusher, sufferers have a significant opportunity to rid themselves of Candida not only now but into the future. Just as important is the fact that the compounds in the product are known to be effective against all strains of Candida bio-films. The common misconception is that only one form of Candida exists when in fact there are numerous strains which are either acquired in different ways or are developments from the original infection. Candida albicans for example can develop into Candida glabrata which is a much more resistant form of the infection. Other common varieties include Candida tropicalis and Candida krusel both of which respond differently to traditional treatments. The situation is further complicated in that the mucosal biofims of Candida albicans are polymicriobial. This means that they are inhabited by many species of bacteria. Canxida Remove treats all these varieties naturally and at least some of its success could also be attributed to the fact the supplement is designed to be slow release taking some 2-3 hours to breakdown in totality. This gives it time to work effectively on and with ingested foodstuffs not only in the stomach but also the remainder of the digestive system. Many studies are now being performed assessing the relative resistance of Candida biofilms in their various forms against a variety of treatments both natural and synthetic. It has recently been established that as an anti-fungal agent Histadin 5 is particularly effective in breaking down the protective barrier of the biofilm in Candida albicans and, although has some influence on the biofilm in Candida glabrata, it was significantly less successful. Both strains of Candida however responded to the treatment with Histadin 5 but failed to respond when treated with Fluconazole. Again it would seem that the Candida biofilm is not affected by traditional treatments but does react when treated with Histadin 5 a naturally occurring peptide which can be found in salivary glands and has long since been known to have antifungal properties. Other studies have shown that some antifungal agents are relatively successful in penetrating Candida biofilms – if not significantly. One study found that fluconazole did penetrate the biofilm more effectively than flucytosine, however neither killed 100% of the bacteria. Another treatment which has been proven to be significantly effective against several strains of candida biofilms including Candida albicans, krusei and parapsilosis is that of Amphotericin b. It was however proven most effective when used in conjunction with histone deacytalase inhibitors (HDA) worked for more effectively and enhanced the properties of amphotericin B increasing the apoptotsis or cell death of the biofilms in all three strains it was tested against. Surprising as it may seem biofilms in a healthy environment are actually a good thing. The protective layer they make forms a thin mucus in the intestinal area and allows for the passage of nutrients into the body. In normal circumstances they protect against inflammatory conditions and also moisten and lubricate the gut lining. In fact we see biofilms everyday. From the film that forms on our teeth to the film that forms in the water bowl of your dog – we are surrounded by biofilms. In a perfect world biofilms are our defenders it is only when things go wrong that the actions they perform result in detrimental effects. In fact many people first attend their practitioner when they notice for example a mucous or slime coating on stools which can be a primary indication of a biofilm infection. In a healthy good environment biofilms protect against inflammatory conditions, and they moisten and lubricate the gut lining. In a healthy environment biofilms actually protect against infection and are defenders of the gut. It’s only when things go wrong that the action biofilms perform result in detrimental effects on the patient. Try to remember that in certain conditions you are more likely to be at risk of developing a biofilm infection. After taking antibiotics for instance or if you suffer from leaky gut syndrome or even have a sugary diet. Many resistant infections or fungal diseases under these, and other circumstances, could well be due to biofilms, and particularly those already diagnosed with Candida. Eric Bakker points out the most common indicators of Candida infection, which include those with digestive dysfunction, nail problems, peripheral problems, vaginal yeast infections and chronic candidiasis to assist identification and those who may well require treatment. There are over 20 different strains of Candida however the most common are Candida albicans, Candida tropicalis, Candida parapsilosis, Candida glabrata and Candida Krusel. One may, if left untreated, develop into another and become increasingly resistant. Oral Candidiasis (Oropharyngeal) or thrush as it is more commonly known, is caused by Candida albicans. It is usually diagnosed by white bumps or lesions on the tongue or inside the mouth and can be treated with anti-fungals in the form of mouth washes, lozenges or prescriptions medications. However as we have already established traditional treatments, particularly where biofilms exist, can be resistant to such treatments and prevention is better than cure. Following the above guidelines relating to diet, treatment and prevention particularly in respect of such advise from professionals as Eric Bakker, in addition to supplementing, and maintaining an established health routine will go a long way to prevent recurrence of this particularly resistant infection and all other Candida related diseases. I was wondering if anyone has any information about the possibility that the vegetable cellulose capsules found in almost all supplements could be used as ‘food’ for candida biofilms. I am taking many supplements to beat candida. They all contain cellulose. I know that cellulase is highly recommended to break down the cellulose in biofilm. You see the dilemma?